MIET AFRICA’s expertise in and innovative approaches to education development have been gained through our experience of working within the Southern African context since our beginnings in 1996. 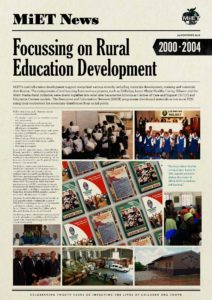 In 1993, the Independent Development Trust commissioned a research initiative exploring the use of popular media— newspapers in particular—in education with a focus on rural areas of what was to become KwaZulu-Natal (KZN). 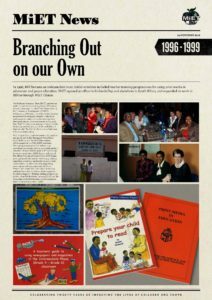 This brought together a journalist, Wilna Botha, and an educator, Lynn van der Elst, who formed the Media in Education (MiE) Division of the Education Foundation. Over the next three years, the MiE team explored ways of using print media in education, developing education supplements for popular newspapers and magazines, running workshops and developing educator guides. 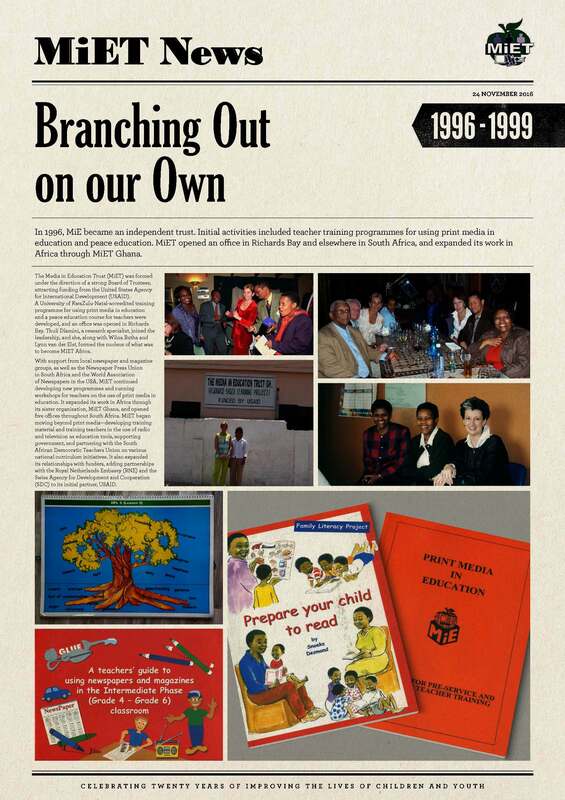 With the birth of a democratic South Africa in 1994, MiE’s role changed to that of supporting the new democracy, resulting in MiE becoming an independent trust. 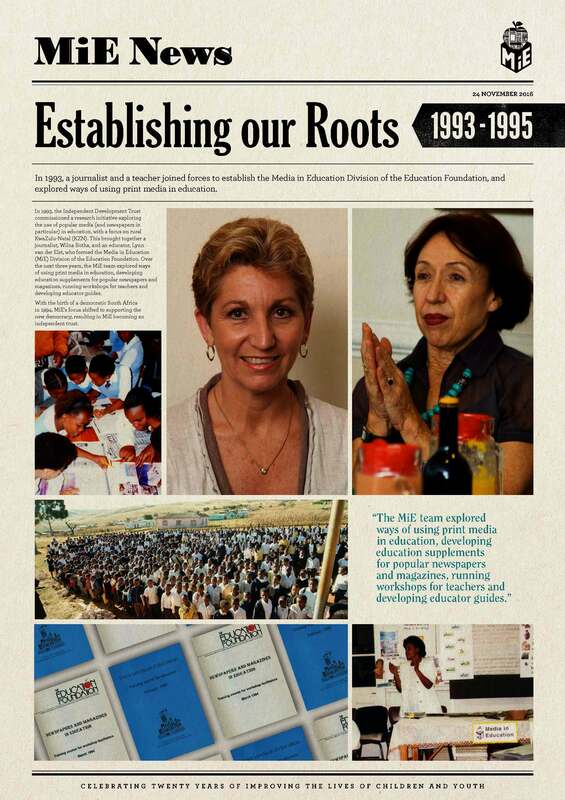 The Media in Education Trust (MiET) was formed in 1996, under the direction of a strong Board of Trustees, and attracting funding from the United States Agency for International Development (USAID). 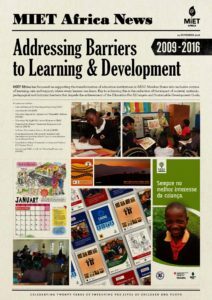 A University of KwaZulu-Natal training programme for using print media in education and a peace education training programme were developed, and an office was opened in Richards Bay. 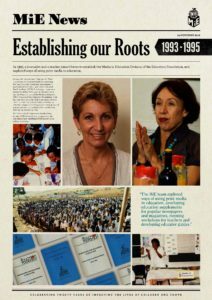 Thuli Dlamini, a research specialist, joined the leadership, and who, along with Wilna Botha and Lynn van der Elst, formed the nucleus of what was to become MIET AFRICA. 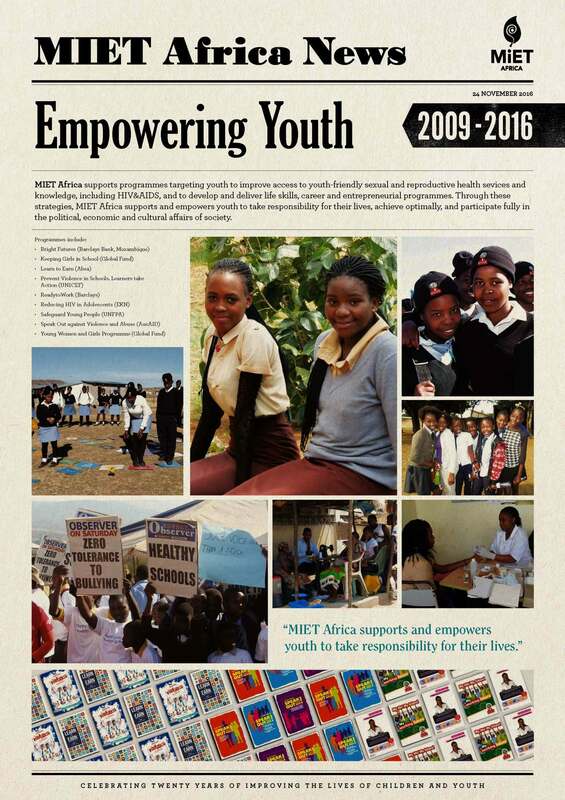 MiET continued developing programmes and running workshops on the use of print media in education, but expanded its work in Africa through MiET Ghana, and opened five offices throughout South Africa. 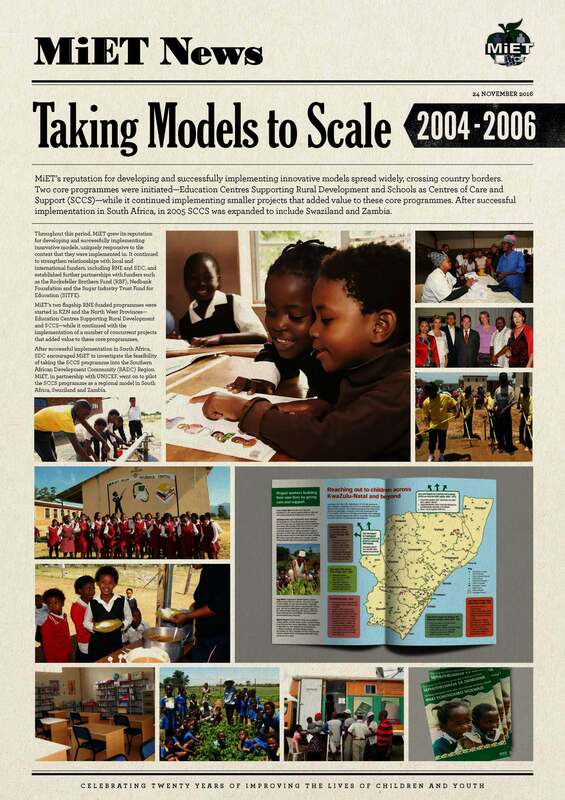 MiET began moving beyond print media—developing training material and training teachers in School TV, supporting government and the South African Democratic Teacher’s Union in various national curriculum initiatives, forming relationships with key funding partners (including USAID and the Royal Netherlands Embassy [RNE]) and developing a model for distributing education materials into rural schools in KZN. 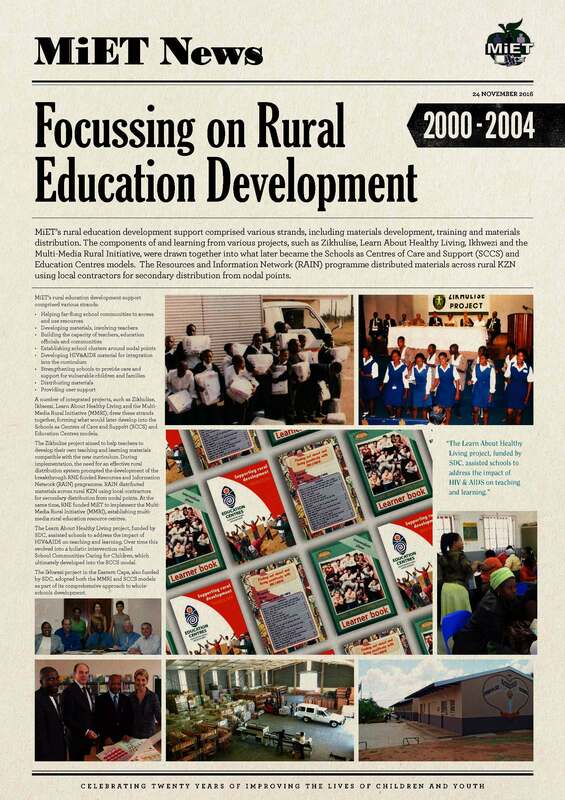 A number of integrated projects such as the Zikhulise project and the Multi-Media Rural Initiative (MMRI) pulled the strands together and this represented the initial elements of what was to be later formalized into the Schools as Centres of Care and Support (SCCS) and Education Centres models. The Zikhulise Project aimed to help teachers to develop their own teaching and learning materials compatible with the new curriculum. During implementation, the need for an effective rural distribution system prompted the development of the breakthrough RNE-funded Resources and Information Network (RAIN) Programme. RAIN distributed materials across rural KZN, using local contractors for secondary distribution from nodal points. At the same time, RNE funded MiET to implement the Multi-Media Rural Initiative (MMRI), establishing multimedia rural education resource centres. Throughout this period, MiET grew its reputation for developing and successfully implementing innovative models, uniquely responsive to the context in which they were implemented. We also continued to strengthen relationships with local and international funders, including the RNE, the Swiss Agency for Development and Cooperation (SDC) and Rockefeller Brothers’ Fund (RBF). MiET’s two core RNE-funded programmes were started in KZN and the North West province—Education Centres Supporting Rural Development and SCCS—while continuing to implement a number of concurrent projects that added value to these core programmes. 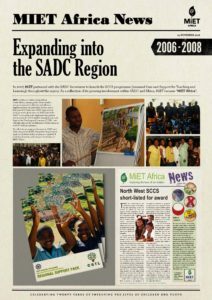 After successful implementation in South Africa, SDC encouraged MiET to investigate the feasibility of taking the SCCS programme into the SADC Region. 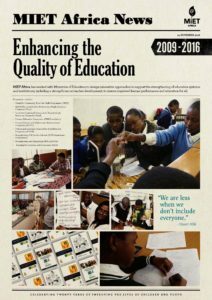 MiET, in partnership with UNICEF and consultation with the Ministries of Education, went on to implement the SCCS programme in South Africa, Swaziland and Zambia. MiET continued scaling up models in South Africa, winning praise from funders and government for the effectiveness of implementation, especially for the SCCS model. The two and a half year pilot into SADC, launched in 2005, proved a great success. MiET joined the SADC Secretariat as its implementing partner for the SCCS programme (renamed Care and Support for Teaching and Learning [CSTL]) throughout the region. 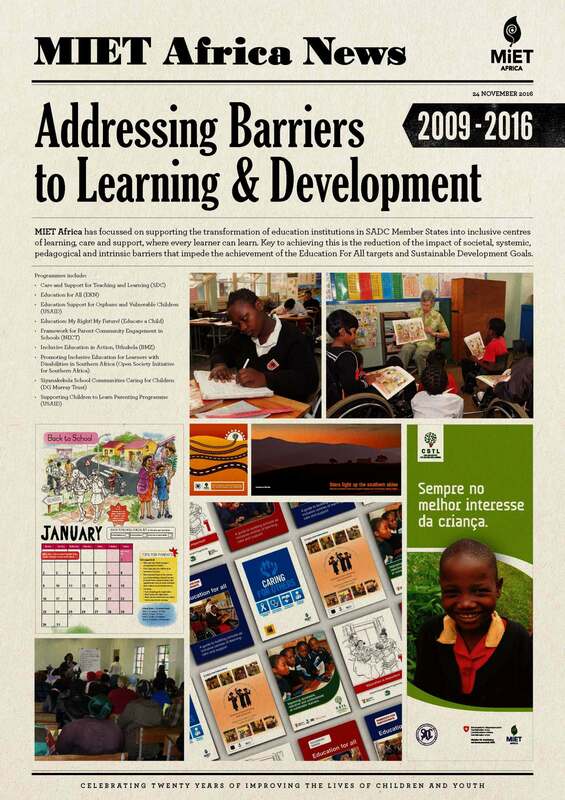 SADC Secretariat as its implementing partner and in 2008, the SCCS model—renamed Care and Support for Teaching and Learning (CSTL)—was officially adopted by the Ministers of Education as a SADC-wide programme. 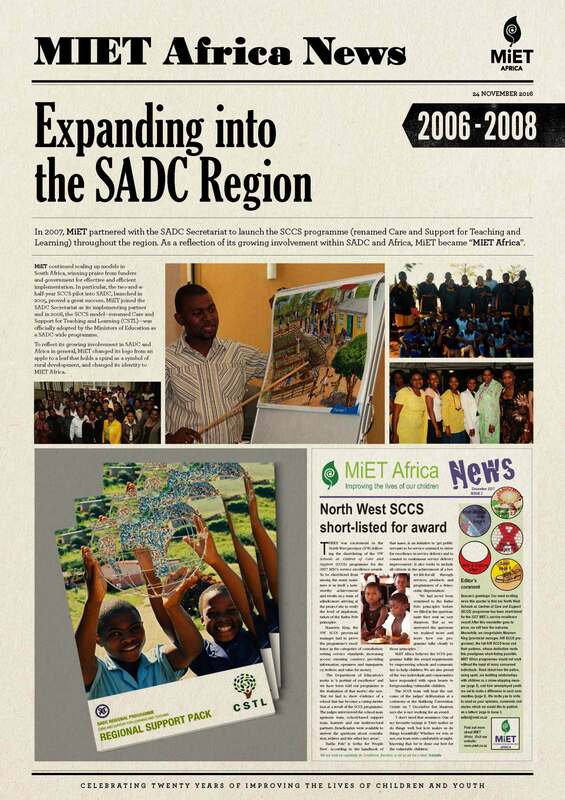 To reflect its growing involvement in SADC and Africa in general, MiET changed its logo from an apple to a leaf that holds a spiral as a symbol of rural development, and changed its identity to MIET AFRICA. MIET AFRICA has focussed on supporting the transformation of education institutions in SADC Member States into inclusive centres of learning, care and support, where every learner can learn. Key to achieving this is the reduction of the impact of societal, systemic, pedagogical and intrinsic barriers that impede the achievement of the Education For All targets and Sustainable Development Goals. MIET AFRICA has worked with Ministries of Education to design innovative approaches to support the strengthening of education systems and institutions, including a strong focus on teacher development, to ensure improved learner performance and education for all. MIET AFRICA supports programmes targeting youth to improve access to youth-friendly sexual and reproductive health sevices and knowledge, including HIV&AIDS, and to develop and deliver life skills, career and entrepreneurial programmes. Through these strategies, MIET AFRICA supports and empowers youth to take responsibility for their lives, achieve optimally, and participate fully in the political, economic and cultural affairs of society.